i was reading the VOL 3 showcase and came across an issue where Sinestro recruited street level thugs, gave them rings, and his old school uniforms. I think it was issue 57-8? they were pretty easily handed their asses by Hal and Alan, but wow there's a germ of an idea there--perhaps this is where Johns got the idea? I have never heard of this. Do you have a scan? I always though Sinestro would have to recruit some more followers if he was ever to realise his dream of taking down the Green Lanterns. He is a little outnumbered. But I also thought he was not a share the power kind of guy. And I still believe there is some kind of protocol in case some members of his corps get the idea that he should be replaced. sorry don't have the ability to scan anything--i'm sure others here could help out. then uses his henchmen to fight Hal/Alan. pretty powerful for one guy, one ring. 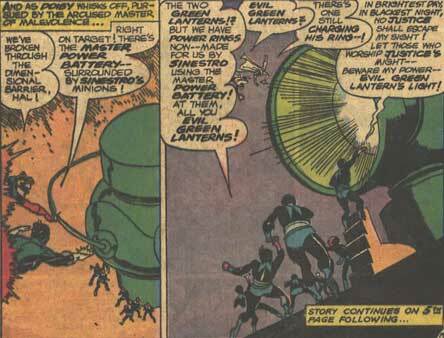 i think they actually are called the evil lanterns or evil green lanterns. Last edited by RichSan; 08-04-2008 at 11:05 PM. 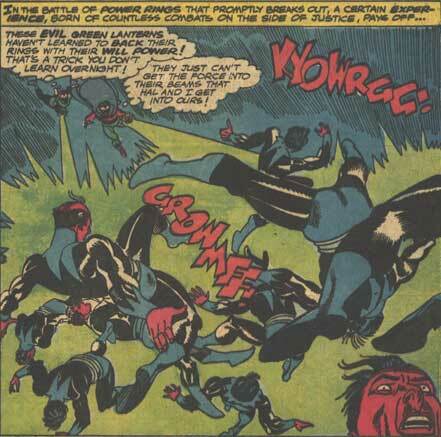 Sinestro has always used others for his "Revenge", what do you think he was doing with the Qwardians he was useing them as a personal army to fight the Guardians and the GLC. I have this issue! I got it way back because I thought it looked neat. 1 issue. Hal's gotten sloppy since then. Johns tells a good tale, but if people ask "why hasn't DC done this already?" They don't know their history! Not including this instance, there has been two other Evil GL Corps ... BOTH Qwardian related! 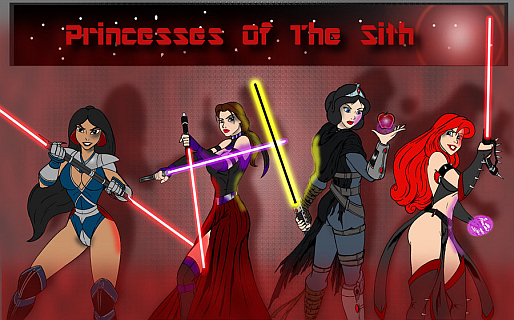 Why do they all LOOK like Sinestro? Awesome, its kind of nutty! Evil Green Lanterns...corny name lol. And also...Evil Green Lanterns that don't wear GREEN. especially that evil oath-when i posted this i had no idea they colored them like koruganians-very strange since they were all human--wtf?!!? They probably confused them with Sinestro himself - figured they were other Krugerians. The early days of comics, what can I tell you? Oh my God, you have no idea. In GL V2 150 the Qwardians create an Antimatter Green Laneter Corps that wears blue, has blue rings, yet shoot "black" light. Beams that are drawn exactly like GL beams, but are colored grey! And yet they are still called the Antimatter "Green" Lantern Corps! In another issue, Eclipso creatres a "negative" image of Hal - complete with a ring. Think "black and white photo" negative. So it's all black with white shadows, right? That means a black ring. But this ring shoots red light (with purple being his weakness)! Last edited by Gauntlet101010; 08-06-2008 at 11:53 PM. Oh Cool I have never seen any pages from this book before. And Alan Scott as well AWSOME!!! I wish they would make more GL Archives, they arent far from this issue. Mabey I can find it on Ebay. Awesome find by the way. The actual error there is the fact that the negative Hal was a black-and-white photo negative, instead of a color photo negative. The chromatographic opposite of green and yellow is red and purple, respectively. 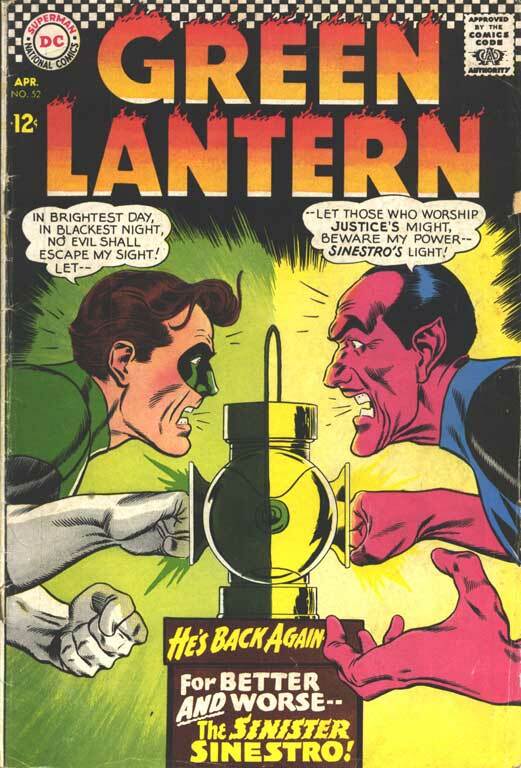 Damn thought I had this issue, have #56 which Hal fights a purple Thing want-a-be. 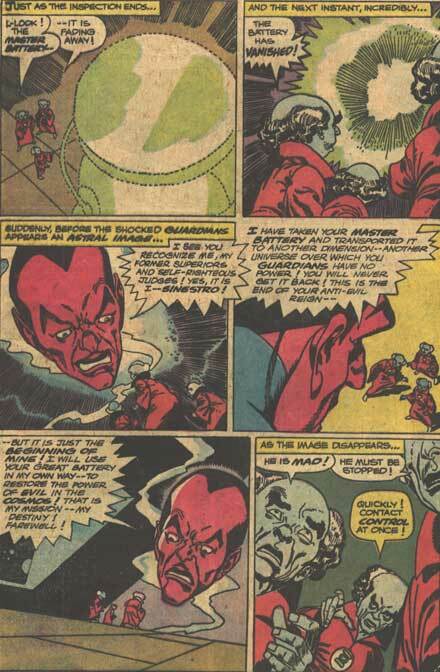 Sinestro should be careful, especially if the Qwardians decide to organize with the Anti-Monitor. Sinestro should give them respect, especially since they are partly responsible for where he is today. Man, this is an old thread! WOW where did this thing get drudged up from? They need to delve more into Thaal's background. It seemed like his parents were highly selfish people, which probably influenced a lot of Sinestro's highly narcisstic nature. Also more info concerning his sister. Yeah, his sister is worth a return.